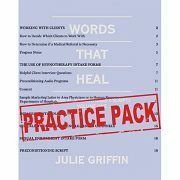 The first eco-friendly downloads of the acclaimed hypnosis scripts by Julie Griffin are now available. No waiting for you, great therapy for your clients, and better for the environment. Each book is sold with license that grants its purchasers rights to use the hypnosis scripts to run groups, clinics, and create and mass produce audio productions royalty free! Recipes for Success features topics you will use again and again with your clients. It contains hypnosis scripts for ten of the most frequently requested topics in hypnosis. Words That Heal contains twelve original hypnosis scripts that will enable you to launch or revitalize your medical hypnotherapy practice. These scripts demystify medical hypnotism and provide hypnotherapy programs that work to heal the body, mind, and spirit of your clients. Look for the addition of more of Julie’s hypnosis scripts as instant downloads soon.